Q. What is the County Council of the Green Party of Los Angeles County (GPLAC)? The County Council is the governing body for the Green Party of Los Angeles County (GPLAC). It is elected by Green Party members, voting in the state presidential primary election every four years. Q, What is the Green Party of Los Angeles County (GPLAC)? The Green Party of Los Angeles County (GPLAC) is the county organization of the Green Party of California (GPCA). Q. What Are The Duties and Responsibilities Of The County Council? The duties and responsibilities of the County Council are defined in the GPLAC bylaws, in Section 5.2 Duties of the Council. They include a range of party building strategies and tasks, internal and external communications and representing the GPLAC to the GPCA. If you run for County Council, you should be ready to assume and carry out these duties and responsibilities. Q. Why Are There County Councils? All political parties in California are governed by the California Elections Code. The Code specifies the duties and qualifications of all political parties, including their state and county organs. According to the Elections code, most ballot-qualified parties, including the Green Party, must hold a county organization election in the state presidential primary election every four years. The Green Party calls its elected County organization the ‘County Council’. Other parties have chosen slightly different names for the same body. The Libertarian and Peace & Freedom Parties have chosen ‘Central Committee’. The Democratic, Republican & American Independent Parties have chosen ‘County Central Committee’. Q. How Many Seats Are There On The County Council And From What Districts Are They Elected? For the 2020 elections, there will be 44 seats up for election on the County Council, elected from 15 State Senate districts. Eleven of the fifteen State Senate districts in Los Angeles County are wholly located in Los Angeles County. The four that are not - 20, 23, 29 and 32 - have only a small portion in County, and therefore have been combined with an adjacent district, adding their registered Green total together to determine how many seats. Q. How Are The Number of County Council Seats Per District Determined? The number of County Council seats per district is proportional to the number of registered Greens in that State Senate district, compared to the number of registered Greens in the county overall, except that each district has a minimum of two seats (GPLAC Bylaws 7-1.4 Number of Seats Per District). The number of County Council seats in each district is determined as of the 172nd day before the County Council election (E. C. § 7913), by the Los Angeles County Registrar's offfice. In 2019 that will be by September 7. Until then as reference, here are the seats per district in 2012 and 2016. Historically, the number of County Council seats in Los Angeles County and the districts from which they were elected, has varied over time. From 1992-2000, County Council seats were elected by State Senate Districts. From 1992-1994, there were 44 seats. Then for the 1994 elections, the County Council voted to change this to 34 seats. This number was in place from 1994-2002. For the 2002 and 2004 elections, the County Council voted to change the number of seats to 17, and to elect them by Supervisorial district. Starting with the 2006 elections, the number of seats has been returned to 44, elected from State Senate Districts. Q. When is the County Council Election? County Council elections are held every four years, at the same time as the California state presidential primary, which in 2020 will occur on March 3. Q. How Do I Find Out Which State Senate District I Live In? Q. What Are the State Senate District Boundaries? To see the district boundaries sdmg.senate.ca.gov/sites/sdmg.senate.ca.gov/files/2011_sdLA_bw_a.pdf. Q. Who Is Eligible To Run For County Council? Q. How Can One Qualify for the Ballot? To qualify for the ballot, a potential County Council candidate must gather at least twenty valid nomination signatures from registered Greens from that State Senate district. These signatures (and the Green registration status of the signers) are then checked for validity by the County Registrar. Afterwards, if enough signatures are valid, one qualifies as a candidate. If the race is uncontested (i.e. if there are as many or fewer candidates than seats per that district), all candidates are deemed elected and the race does not go on the ballot. If the race is contested (i.e. if there are more candidates than seats per that district), then all candidates are placed on the ballot for a vote, and top vote getters equal to the number of seats are elected. In order to gather your nomination signatures from registered Greens in your State Senate district, you have several options. First, go to Greens you already know. 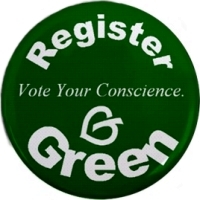 Second, register people as new Greens and obtain their signatures, either via a physical voter registration form (which are available at post offices and libraries), or via this on-line voter registration page. You may also purchase a list of Green Party voters in the district in which you seek nomination, which you can use to contact them and seek their signatures. The Los Angeles County Registrar Recorder/County Clerk's office charges $54 for such a list, and it can be made available on a CD and sent to you, or you can order it in advance and have it ready when you go to the Registrar's office to take out your nomination papers. The lists contains phone numbers and emails for many, but not all, Green Party members in each district, which you can use to contact them and seek their signatures. For more information, contact the Los Angeles County Registrar Recorder/County Clerk's office at (800) 815-2666 or fill out this form. You can also post your nomination signature gathering efforts on official GPLAC social media - Facebook and MeWe - and invite people from your district to sign your nomination petition. Q. What Are the Filing/Nomination Signature Gathering Dates To Qualify As A County Council Candidate? The period within which one can begin to gather signatures and then submit them for validation will be between September 27 and December 6, 2019. These dates correspond to E-112 and E-88, indicating the number of days before the County Council election, according to the California Elections Code (E.C. €€ 8020 & 10407). One can hand in signatures before the ending date and have the County Registrar's office check their validation, with the option to hand in additional signatures if you have not reached the twenty signature threshold. To fill out the official papers and obtain the official nomination signature gathering forms, one must go to Norwalk to the County Registrar's office. Q. Where is the County Registrar’s Office and What Is Their Contact Information? Q. Can one run as a write-in candidate for County Council? Yes. The qualification period as a write-in candidate is between January 6 and February 18. To qualify as a write-in candidate, a candidate must obtain 25 valid nomination signatures between those dates. To become elected, a write-in candidate must both receive a number of votes equal to or greater than 2 percent of the number of party members voting in the county council election district at the presidential primary or 20 votes, whichever is less (E. C. § 7923) - and finish ahead of enough other candidates to win one of the seats up for election in that district. Q. Will the GPLAC Be Promoting the County Council Elections and County Council Candidates To Its Members? Yes. Before the beginning of the Signature Nomination Period, the GPLAC will send email to all of its members that it has email address for, to let them know about the County Council elections and how to run for them. Once candidates have qualified for the County Council ballot, each will be entitled to have a candidate statement on the GPLAC web site. Links to these candidate statements will then be emailed to GPLAC members before early voting begins for the March 3, 2020 County Council election. Q. What If All Of The Seats Are Not Filled In The March 2020 Election, Or If There Are Future Unscheduled Vacancies? California Elections Code § 7904 gives elected County Councils the power to appoint additional County Council members at its discretion. GPLAC Bylaws specify in Article 8 - County Council Vacancies, that if there is a County Council vacancy after the election, or at any time as a result an office being vacated, seats may be filled by County Council appointment. Potential appointees must gather the same number of valid nomination signatures - twenty - as if they were running for the office during the regular election. The County Council then votes upon one vacant seat at a time. Voting may occur at a face-to-face meeting, or by an on-line vote.